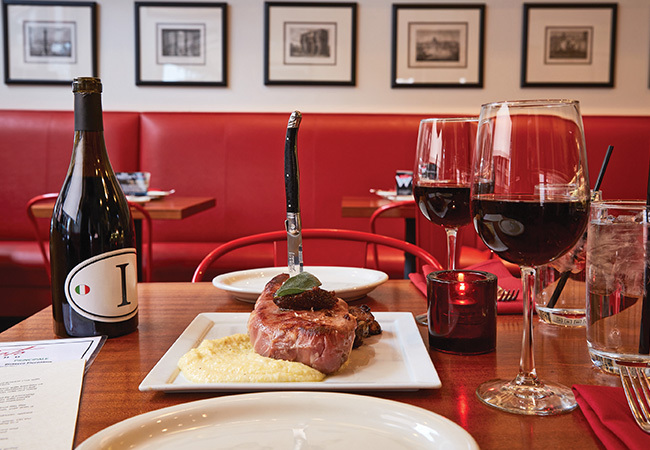 Whether your definition of romance includes wine and roses or charcuterie and comfy leather couches, Nancy Miller promises that these dining destinations will serve up an evening to remember. If it’s not the date of your dreams and if you’re rolling your eyes instead of gazing into your partner’s, you’ll appreciate RIVUE’s view, perhaps the best in the city. For a date that hits the skids from the get-go, order the Dirty Rotten Shame cocktail. But, when the chemistry is good, sharing the view will be a beautiful add-on to dinner atop The Galt House Hotel. Chef de Cuisine Kendall Linhart, who has worked with national hot shot chefs such as Daniel Boulud and Michael White, likes to source local products and supports sustainable fishing practices. 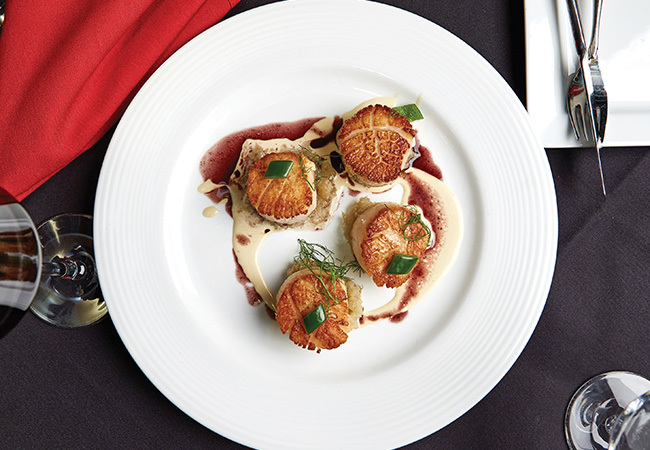 “We have scallops from Maine and snapper from the Caribbean,” says the chef who can be expected to serve the unexpected. The snapper boasts a southern flair, being non-traditionally accompanied by cannellini beans and collard greens. His Peking duck breast with braised endive, almonds, grapes and Skordalia sauce is a showstopper of a date dish. Dessert offerings run from a decadent chocolate bombe to a lighter goat cheese cake with candied beans, blackberries and thyme-infused honey. “Our caramel apple crostada is a romantic thing to share. Of course, you don’t share food unless you really care about the other person,” he adds. Who can imagine not caring about the bourbon ball flight? Dark and white chocolate and three different bourbons. So delicious they spark a ho-hum date with a pleasurably sweet kick. Double dates are a frequent occurrence at Mercato Italiano where couples relax in a casual atmosphere and indulge in Italian dishes that range from traditional to innovative interpretations. “Our upstairs dining is a little quieter for those who want to enjoy dinner for two in a more romantic setting,” says chef and owner Peter Pagano. Regulars keep returning for mussels served over pork sausage, four types of pizzas and short rib ravioli. They and first timers will be delightfully confronted with new dishes such as tortellini con maiale (ground pork, spinach and ricotta in a pork broth), butternut squash gnocchi and branzino (Mediterranean sea bass) over root vegetable salad. Pagano could serve his chicken saltimbocca with pasta or mashed potatoes and receive no complaints, but being a culinary matchmaker, he decided to pair it with a seasonal salad of butternut squash, beets and kale. It has caught on among guests at the Norton Commons spot. Brunch might be a fun, no-pressure date. Choose from dishes like steak and eggs, a choice of four frittatas, Belgian waffles or paninis. If your dating has been smooth sailing and you’re ready for a meet-the-family dinner, Pagano welcomes you to Nonna’s Night, held every Sunday. Reminiscent of his childhood gatherings at his grandmother’s house, the family-style dinners feature an antipasti platter, chicken cutlets, spaghetti and meatballs and Nonna’s cheesecake. 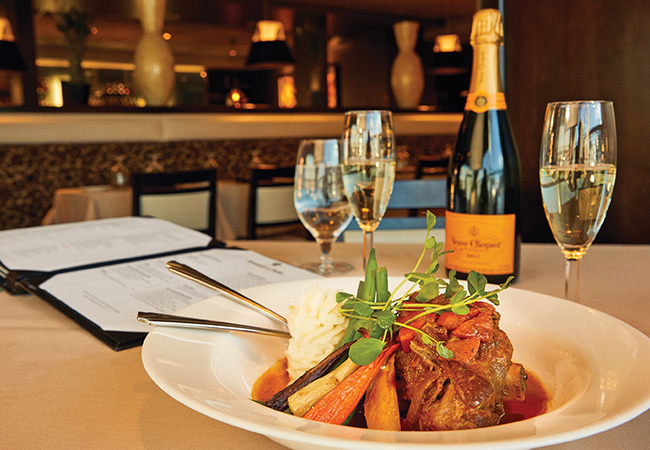 Depending on what kind of evening you had in mind, you may join a community table or request a private table for two. 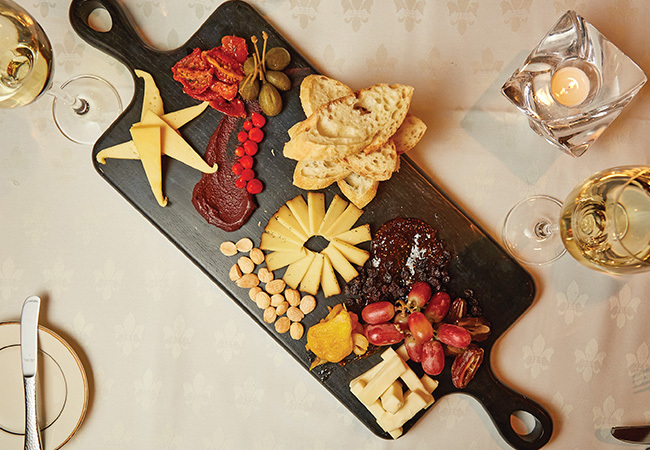 Equus Restaurant/Jack’s Lounge is part of Louisville’s culinary history. Jared Matthews is respecting the vision of founder Chef Dean Corbett while infusing both spaces with his own signature style. He’s thrilled when guests choose Equus and Jack’s for a first date or a night of rekindling romance. “People seem to like coming here because they can choose between Jack’s Lounge, where they can relax in a casual but intimate setting of leather couches and candlelight or the Equus dining room that’s a little more formal,” says Matthews. Grappling with the quandary of choosing among starters such as the restaurant’s nothing-short-of-famous nachos, crab cakes or mushroom fumé can be a bonding experience. For an entrée, if your appetite is running more toward down-home and hearty rather than gourmand lofty, you probably won’t say no to Yankee pot roast or fried chicken. Balancing the menu are dishes such as rock shrimp Jenkins, Scottish salmon and wild boar with bordelaise sauce. “The filet mignon with Four Roses demi-glace is a popular date item,” Matthew says out of experience. That’s not surprising to Louisvillians who have a fondness for bourbon straight, on the rocks or sauced up. The chocolate raspberry torte is a delicious aphrodisiac. If you want to ramp up the finale, the Café Gates, an after-dinner drink of Grand Marnier, crème de Cacao and cream will do the trick. As we all know, dates can have their glitches. But the glitches won’t come from the food or atmosphere at Anoosh Bistro. “We’re a great spot for dates because of our elegant atmosphere that has a special occasion feel. And we have some very nice private areas for quiet conversations,” says Executive Chef Mark Ford. An appetizer such as lobster bisque is a classic dish that speaks of the restaurant’s four-star fine dining. Grilled artichoke or shrimp Julep are reliable conversation starters and palate pleasers. And you may learn a lot about the other person by his or choice of items for the cheese and charcuterie platter. Pâté or soppressata? Prosciutto or country ham? French Brie or goat cheese? “We make it a point to know what dietary preferences are trending,” says Ford. He and owner Anoosh Shariat, a vegetarian, create an array of vegetarian dishes such as mushroom pasta, vegetable Bolognese and vegetable Wellington. White tablecloths, live jazz, a waterfall, fresh flowers and candlelight set the mood for date night at Varanese. Okay, enough about the ambiance, you say? What about the food? Chef/owner John Varanese has been a featured chef at the James Beard House in New York. That’s an accomplishment that should assure you he’s up to the task of creating a menu worthy of a special night of getting-to-know-you or so-happy-I know you. But you don’t have to look toward New York for kudos to him. Louisville diners are smitten with him and his menu. “Over the years we have seen multiple marriage proposals take place here and many people return for their anniversaries,” says Varanese, who has been called on to display an engagement ring in a dessert or surprise a guest with a necklace to celebrate an anniversary. His menu is replete with a diverse selection of meat, seafood and vegetarian fare. “I always think something light and colorful is good for a date night. 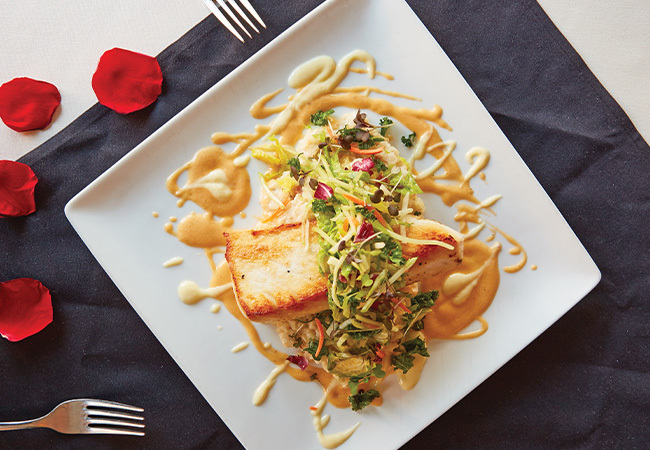 Our pecan-crusted white bass with honey jalapeño butter has proven to be a favorite,” he says. One of his personal top picks would be Hawaiian butterfish with smoked bacon, caramelized onion risotto and tomato butter sauce. An appetizer platter of lump crab-stuffed fried avocado, pork biscuits, barbecue duck confit egg rolls and cheese spheres is a sure-fire jump starter to any dinner.